The IDIAP Head-Pose database contains data that can be used to investigate human head pose estimation from video. It combines data from cameras showing one or more heads of participants, as well as information about their head pose, as measured by 3D location and orientation trackers. In the meeting scenario case, the data comprises 8 videos of around 8 minutes featuring two persons (cf sample image). See the IHPD webpage for more details and download. The dataset consists of a 45 minute long video, shot from the third floor of a building and looking down at a part of a junction controlled by traffic lights. 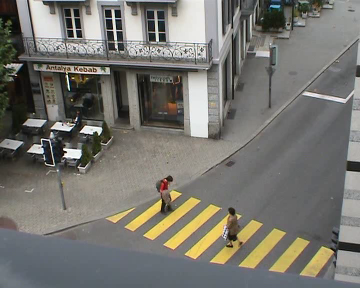 The video contains multiple instances of unusual events such as vehicle stopping after the stop line, car entering the pedestrian area, or people crossing the road away from the zebra crossing. The EYEDIAP dataset intends to fill the need for a standard database for gaze estimation from remote RGB, and RGB-D (standard vision and depth), cameras. 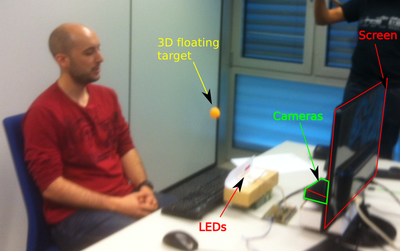 The recording methodology was designed such that we systematically include, and isolate, most of the variables which affect the remote gaze estimation algorithms: head pose variations; person variation; changes in ambient and sensing condition; types of target: screen or 3D object.